Have you ever thought of your environment as a teacher? In the Reggio Emilia approach to education it is said that there are three teachers, the child, the teacher, and the environment. What are we surrounding ourselves and our children with? Are we making spaces in our homes that encourage learning and exploration? As I have contemplated these thoughts and questions myself, I have gone to work to create learning zones throughout my home. The lower shelves of books. I've set up two bookcases in our family room between comfy couches and our fireplace. The bookshelves are arranged in a friendly way for readers. The bottom shelves hold books for my youngest reader and picture books that we all enjoy. We have a shelf that holds reference books and other non-fiction. There are shelves of classics that are low enough for all eyes to see. I also have a basket on the trunk in our family room where I display new books or books on topics that my boys seem to be interested in at the time. I may throw in a book that I hope will catch their eye and create a new interest as well. Our shelves of handwork choices. There are two shelves in our family room on the other side of the fireplace that offer choices of handwork. Peg boards, geoboards, tangrams, weaving looms, intricate coloring books, and other activities sit on these shelves. My boys are invited to pull from these shelves during read-a-louds and at other quiet times. The boys doing some handwork. Working with clay at the kitchen table. When remodeling our kitchen we opted for a long table with benches instead of a center island. This table not only serves my needs when I'm in a wheelchair, but also provides a space for the children to join in with food prep and a large flat surface for creating art. The cookbooks are on a low shelf under the window and all cooking utensils (besides sharp knives) are within reach of all the children. There are baskets of art supplies that are readily available at all times for exploring and self expression. I make sure to have a variety of art mediums available for even the smallest hands in our house. We have a finish on our table that is rustic and invites messes of an artistic nature. It's much more fun to make art when you aren't constantly worried about ruining the table. We have inexpensive plastic tablecloths and butcher paper on hand for especially messy projects. Art supplies stored in the kitchen. Sometimes a classroom is just what you want. With maps, a whiteboard, a globe, a calendar, and a timeline on the walls, it's the perfect place for group learning. I tried to make this space blend with the rest of our home by painting it with warm tones and adding a big comfy chair, a small round table and beautiful artwork and furniture. A large cabinet holds drawers for designated subject exploration. The math drawer holds math games and tools, the language arts drawer holds writing and reading activities and games. Cubbies in the closet-turned-desk-area give us each a space to house our books and notebooks specific to our studies for the year. The boys hang out in this room a lot with friends as well and I'm glad it still feels like home. Our front room houses all of our musical instruments. We are not great musicians, but we have happened upon some good deals on some wonderful instruments that encourage all of us to try harder to do more musically. We have a beautiful piano that the boys and I play (I try to play) and my husband's acoustic guitar along with two electric guitars for the boys. Because they are always in sight they are often played with. Playing in the greenbelt next to our house. Being outdoors is important to me and important for learning about nature, community and how the world works. We have a garden where we all work together to plant, care for, and harvest vegetables and fruits. We have a chicken coop in the backyard with hens that we care for, play with and collect eggs from. The boys have space in the backyard for digging, building, and creating. Mud happens here. Living on a small lot in town doesn't allow for much yard space, but luckily we live right along a greenbelt where there is a small wood to explore. As the days get warmer we love to take walks and look for wildlife. As the boys get older, this becomes a playground bursting with learning opportunities for them. 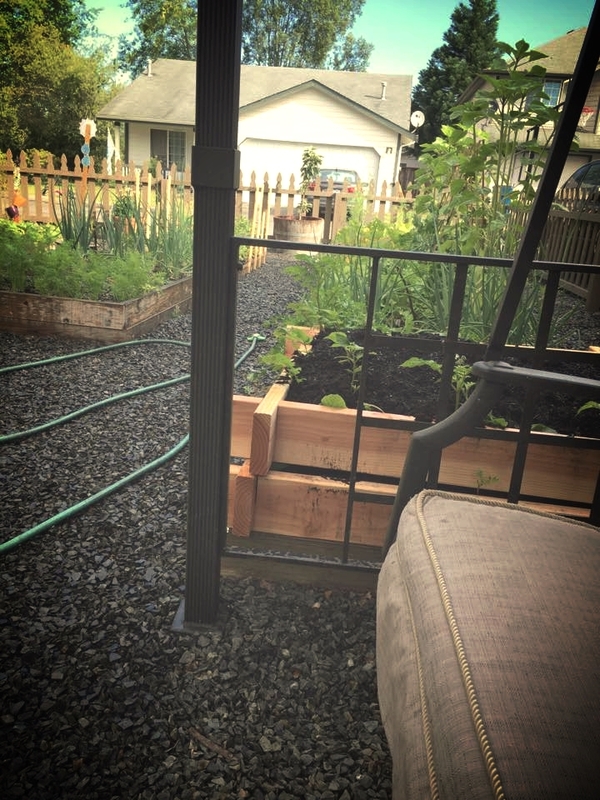 A garden provides a place for relaxing and for hard work. While having a stimulating environment can be good for inspiring, a cluttered environment can overwhelm and cause the mind to shut down. Finding a balance is key. Think of an art museum, every piece isn't displayed all at once. Some pieces are kept in storage while others are highlighted and displayed in a way that allows the patrons to get to know each piece individually. Don't be afraid to put some things away and display that which you hope to draw focus to. Rotate things in and out of prominence in your home to keep things fresh. Don't forget to display your child's artwork in your home. When they see their work hanging alongside other pieces they will feel that their manner of expression matters and that they are contributing to their community. When displaying wall art, think of the height of those that live in your house. A piece is more engaging when it's at eye level. Music can add a lot to an environment, think about what mood you are wanting to create and find something to match. Background music can change the feel of your home quite quickly. Music with lyrics is great for getting some cleaning done, while instrumental pieces are better when reading or creating. Quotes of importance that you wish to memorize or internalize can be displayed on chalkboards, bulletin boards or put in frames. When possible use open storage, such as baskets, for holding supplies. Not only does this make them more visible than if they were in drawers, but it also makes for easy portability and clean up. Rotate what art mediums you have out and available if your space is limited. Other supplies can be stored in closets while they are not being featured. Whether you have children that are private, public, or home schooled, or if you want more inspiration for yourself, designing spaces that make opportunities for learning and creativity visible and readily available is important in building an environment that invites learning and self expression. On Sundays, as we prepare for another week, we each choose what we would like to learn about and place the list and materials in our baskets. During the week we learn things together for a few hours each day, but the rest of the day is usually devoted to individual studies or play. That's when the baskets come in handy. Ten tips to help you find your way. Some of my favorite things to do to keep the winter months magical. It's the day after Christmas and all through the house, there are Legos and cookies and the cat's new toy mouse.